Long Ago, I posted blog on “How do i know what packages are transferring from specific site to Distribution Points and what is the % of content left and completed using tool called sender analyzer ,More info here . Due to the changes in Configmgr 2012,the above tool no more support and haven't see any other tool that gets the similar information. 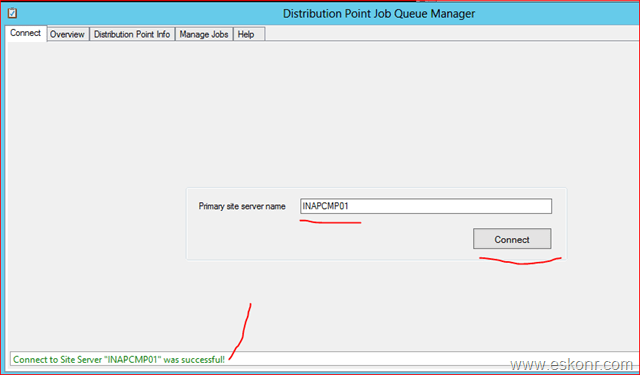 Configmgr 2012 R2 toolkit bring out some nice tools which really helps troubleshooting day to day activities .One of the new tools which was added into R2 Toolkit is Distribution Point Job Queue Manager (DPJobMgr.exe) which helps troubleshooting and managing ongoing content distribution jobs to Distribution Points also it be easy for us to know how many min/hrs/days it takes to send complete package. In this post,i will walk though the features and how to use this Tool. The tool displays the list of jobs that the package transfer manager component has in its queue as well as the status of the jobs (ready to be executed(Pipeline which you can see from inbox folder, running or retrying). This tool also allows manipulation of the jobs in the queue, moving jobs higher on the list, cancelling or even kick start running a job manually. Note:This tool do not support to connect to CAS OR Secondary Site to know what packages are sending to its child Sites .It works only to know the content sending from Primary Site. Once the connection is successfully established ,You can see a notification at the bottom of the tool that confirms that the tool is connected to the site server saying ‘connect to Site server was successful’. This tab Shows the summary of all the jobs on all distribution points(this tool do not display primary or secondary sites,shows only DP’s). All the nodes are self explanatory here. 2. Running Jobs: Shows the number of concurrent jobs that are running on a particular distribution point. Note: Number of concurrent software distributions is a setting that can be modified in Software Distribution Component Properties. 3. Total Jobs: Shows the number of all the jobs that are targeted to a particular distribution point. This number includes the jobs that are running, retrying, or waiting to be executed. 4. Total Retries: Shows the number of times jobs have been retrying in a particular distribution point. Higher number may represent a general problem in that particular distribution point. Start Auto Refresh—>Refresh this tab automatically to know if there are any new jobs added to the package transfer queue(Default is 2 min). This tab Shows the list of all the distribution points under the particular site(P01) that the tool is connected to. (keep in mind,only DP’s but not secondary sites). List of all the distribution points can be seen on the left hand side pane, you can select which distribution points you want to see the status of current running jobs.You can also select all Distributions if you want. The right hand pane will show the jobs only for the selected distribution points. From the above screenshot,i have one job running which is Windows 8 image. For each Distribution Point,you would see 8 columns and i think they are all self explanatory like software name,package ID,Size of the package,what is the progress %,start/restart time,no of retries and DP name. If you are sending BIG packages like OS images or other apps,it takes time to get the the progress (%) of the completion and shown under “Progress” column . Note:Each column can be sorted either by descending or ascending order. Shows list of all the jobs and their status in one view. This tab also Contains the same eight columns as the “Distribution Point Info” tab, but now all the jobs can be right clicked to perform certain actions like cancel the package,retry etc. 2. Move To Top: Moves one or multiple jobs to the top of the queue, this may result in this jobs to start running immediately. A lower priority job can pause running as a consequence of this action. 3. Move Up: Moves a particular job one row above, a lower priority job can pause running as a consequence of this action. 4. Move Down: Moves a particular job one row below. 5. Move To Bottom: Moves one or multiple jobs to the bottom of the queue. 6. Cancel: Tries to cancel one or multiple jobs. Note :Jobs that are near their final completion time or jobs that are on site server (if the site server is also a distribution point) cannot be cancelled. From the above screenshot,you can the job running.By mistake,you distributed the BIG packages to unwanted DP’s and you want to cancel the process before it completes,right click on the package and say cancel. You get prompted with below screen asking for confirmation. If you click on Yes,it will send the package notification instruction (.pkn)to cancel the thread which you can see from pkgxfermgr.log file. Nice to have such cool tools for content troubleshooting. 23 Responses to "Configmgr 2012 R2 Toolkit: DP Job Queue manager (DPJobmgr.exe) pkgxfermgr.log Analyzer"
Updated the post with correct link .Download SCCM 2012 R2 toolkit from https://www.microsoft.com/en-us/download/details.aspx?id=50012. just to be clear, I am logged in on the primary site server as admin whith all roles enabled, the DP is primary as we have no secondary sites or servers. Hopefully you have more leeway in to Microsoft to investigate this issue. Thanks in advance. Have you looked at the permissions ? Did you solve the issue if so,how did you fix it ? Having a problem where on the primary site server I can't see Distribution points ( even thought it connects w/o problems). Has anyone got a silver bullet for this problem? This DP manager tool do not show up the distribution points under secondary sites ,it seems it works only distribution points that are attached to primary site .I think this is limitation of the tool ,however you can use sender analyzer tool as alternative for now . ditto - running on site server - run as admin - logged in as administrator - "no distribution point was found in this site"
It will list the distribution points that are associated with only primary site. Distribution points under secondary sites do not show and that is how the tool works. Are you able to connect to prinary site successfully? strange.I have not seen any such errors ,it works good for me on lab and production.I would contact Microsoft for the fix. Do you have enough permissions on thr dps? It works only for primary site which means it lists dp under primary site but not secondary site dps.. Its feature of this tool.. Hope we see an update from Microsoft on this. The connection to the site works fine but I receive an error No distribution point was found on this site. this tool kit support sccm 2007 sp2?